Peter MacCallum is senior lecturer in haematology at Barts and The London School of Medicine and Dentistry, Queen Mary University of London, and honorary consultant haematologist at Barts Health NHS Trust, London, where he has served as Head of clinical and laboratory haematology since 2004. He has been clinical lead for thrombosis and anticoagulant services since 1996. He qualified in medicine from the University of Sheffield and trained in haematology in Manchester and London. He was an MRC Clinical Fellow based at St Bartholomew’s School of Medicine prior to appointment to his current post in 1995. He has held the position of Principal Investigator in a number of trials of the new oral anticoagulants for stroke prevention in atrial fibrillation and in the management of venous thromboembolism, and is Chief Investigator of a UK-wide study examining outcomes of major bleeding in anticoagulated patients (ORANGE study). He is also the UK Chief Investigator for GARFIELD-VTE, a global cohort study of the long-term outcomes of patients with newly diagnosed venous thromboembolism. 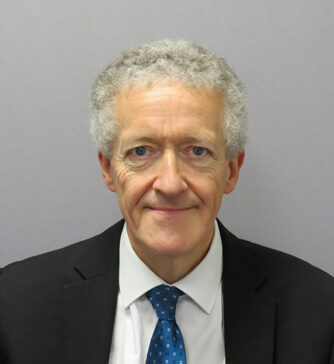 He has been a reviewer for the National Institute of Clinical Excellence (NICE) clinical guidelines and has served an a specialist member of both the NICE Diagnostic Advisory Committee and the NICE Technology Appraisal Committee. He has co-authored national guidelines for the Royal College of Obstetricians and Gynaecologists on the prevention of venous thromboembolism in pregnancy and the puerperium. He has had numerous papers published in the field of thrombosis, including research into the epidemiology of travel-related thrombosis, thrombotic markers of pregnancy-related problems, and the importance of fibrinolytic activation in trauma patients.